In my spare time I play all kinds of games: From table top to computer games and role playing. This is a place for me to write about what I do, what I learn and document games. Sadly, I never got to far into my campaign as the more-or-less good Bosonid-family. Mainly I have been distracted by illness in my family which has affected us all greatly. Thankfully things are getting better although it will continue to be a struggle for my family. After the events of last episode we find ourselves in the position as lord of Nice which has the monastary of Nizza as its capitol. This means that, since we are a duke rather than bishop-prince, we do no collect all the taxes due to us. This quibbling about titles forces us to find ways of remaking it into a proper feudal province by rather unsavoury means, in this case murder. Luckily for us the province contains the castle town of Monaco, unluckily for the lord of Monaco we need his title to convert the province. That means he has to go. The man is childless so upon his death the title will revert to his liege, ie. us. It is with a heavy heart that the Duke signs the assassination order since the man we are about to have killed is a staunch supporter of our reign. While we have been busy ousting useless vassals and ordering assassinations, some vassals in Lotharinga has been grumbling about their liege and his intention of letting his son take over when he dies. This grumbling has now reached a fever pitch and resulted in open rebellion which splits the country into two camps: one supporting the current heir and the other fighting to put an elective monarchy in place. However, this faction is rather small and will find it a difficult and lonely battle. Lotharinga is not alone in acquiring rebels. A small Christian uprising in the mountains of the Pyrenees threaten the Muslims on the Iberian peninsula. Though small, this might nudge Asturias to declare war on the Umayyad and start the Reconquista. "Magyars feel hungry, settle to farm." 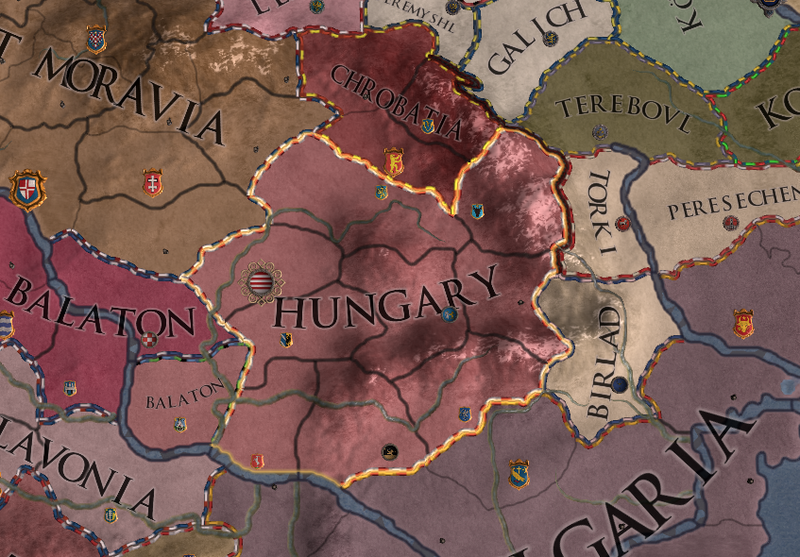 While one kingdom is in turmoil another is forming: The Magyars have ceased their roaming and have settled around the Carpatian mountains, creating the kingdom of Hungary. The country is precariously positioned between Bulgaria in the south and Great Moravia in the north-west and will have to work hard to survive since they will find no allies in their neighbours who are Orthodox and Catholic, respectively, while Hungary follows the Tengri beliefs. 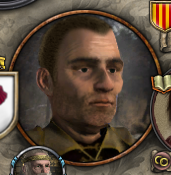 As the portraits start coming in on wagons, I realise that our king has two daughters one of which would make an excellent wife for my grandson. However, she is only 14 years and my impatient boy will not wait for her to mature and a betrothal would surely mean that the king will come back the day before the wedding and suggest that it be matrilinear and refuse to go through with the original wedding plans. Besides, Italy is agnatic and so there is no inheritance to be gained from marrying them. Still, she could be all right for one of his siblings to establish an alliance... But to find young Boson a mate we shall clearly have to look further afield.